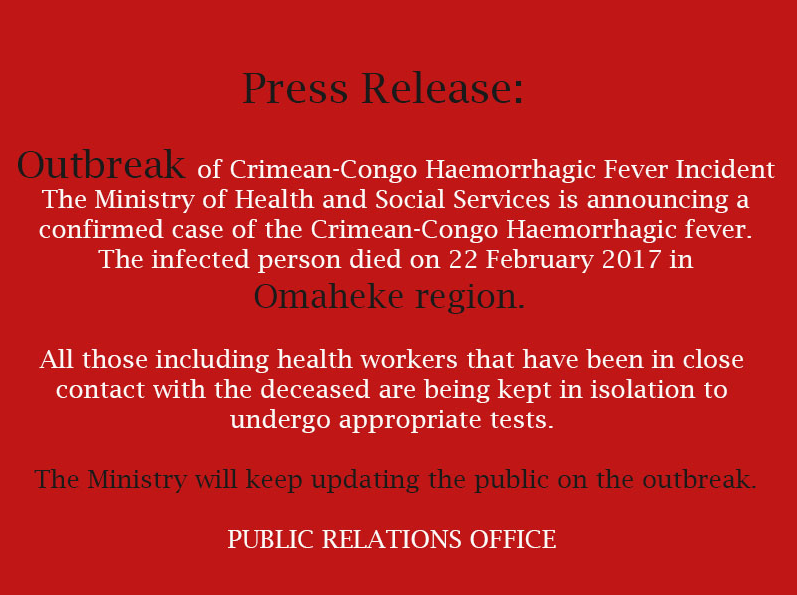 A farmworker from the Omaheke region on the eastern border of Namibia has died from Crimean-Congo hemorrhagic fever (CCHF), according to Namibia health officials. According to a report in The Namibian, The unidentified man died on Feb. 22 after being admitted to the Gobabis District Hospital when he vomited blood. He was treated for fever, diarrhea, and coughing a few days earlier. Family members confirmed that he was bitten by a tick. As a response and intervention, 4 nurses and a doctor who had close contact with the deceased have been quarantined and are currently being monitored at Gobabis. According to the WHO, Crimean-Congo hemorrhagic fever is a widespread disease caused by a tick-borne virus (Nairovirus) of the Bunyaviridae family. The CCHF virus causes severe viral hemorrhagic fever outbreaks, with a case fatality rate of 10–40%. CCHF is endemic in Africa, the Balkans, the Middle East and Asian countries south of the 50th parallel north – the geographical limit of the principal tick vector. The hosts of the CCHF virus include a wide range of wild and domestic animals such as cattle, sheep and goats. Animals become infected by the bite of infected ticks and the virus remains in their bloodstream for about one week after infection, allowing the tick-animal-tick cycle to continue when another tick bites. Although a number of tick genera are capable of becoming infected with CCHF virus, ticks of the genus Hyalomma are the principal vector. The CCHF virus is transmitted to people either by tick bites or through contact with infected animal blood or tissues during and immediately after slaughter. The majority of cases have occurred in people involved in the livestock industry, such as agricultural workers, slaughterhouse workers and veterinarians. Human-to-human transmission is possible.